Mentor Monday ~ Laura Resau – Be someone's hero. No cape required. A gigantus MENTOR MONDAY welcome to Laura Resau, author of six novels in cluding RED GLASS, WHAT THE MOON SAW, RUBY NOTEBOOK, and the newly minted, THE QUEEN OF WATER (co-authored with María Virginia Farinango). This novel, which is based on a true story, begins in an impoverished Andean village where seven-year-old Virginia is taken from her indigenous family to be an unpaid servant. For the next eight years, she struggles to hold on to her spirit and humor in the face of oppression. But once she’s found her freedom, will Virginia – now a teenager caught between cultures – also find a place where she belongs? I have my copy—can’t wait to dive in! Feel free to go to Laura’s website page to read an excerpt from THE QUEEN OF WATER, as well as the poignant inspiration for this wonderful book. 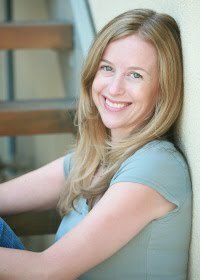 I first met Laura as I arrived as a wide-eyed, freshman member of the Gangos (Erin Murphy Literary clients) who traveled out to Portland, OR., for an agency retreat back in 2009. I was actually awed enough to be quiet for two hours. From reading Laura’s work, I knew she was a fabulous writer. She also had all of these wonderful stories of her travels and how her adventures fed her written stories. Fascinating. Beautiful. Sad. Inspiring. However, the strongest impression that I came away with of Laura, was that she has a “steeped in wisdom” quality about her. (Remember those EF Hutton commercials? Well, when Laura spoke, I’d stop to listen.) About writing, about marketing , and about the writing life. When I expressed some nervousness about school visits down the road (before my ms had even been submitted to editors), she looked me in the eye and told me that I was a natural story teller and that I had nothing to worry about. And you know what? I believed her! I was instantly at ease with the whole thing. Speaks to the power of words and small kindnesses, doesn’t it? So, I guess, Laura mentored me that weekend! My mentor came on the scene later in my writing journey, but at what turned out to be the perfect time. Mentor-less for many years, I’d managed to bumble my way through writing and revising my first YA novel, What the Moon Saw, thanks to a smattering of enthusiastic teachers and writing group members (and my mom) who gave me guidance. Of course, it would have been wonderful (and time-saving!) to have had a mentor during the five years it took me to write the book. But a mentor-of-sorts did come along, just in time to help me navigate the rough waters of the publication process and beyond. Lauren Myracle (of the Luv Ya Bunches and TTYL series) became an invaluable (and supercute, superfriendly, supersmart) resource for me. She’d always been supportive of me and other prepublished writers when I saw her at events in Fort Collins (where we both live). So, when I got a voicemail message from an editor at Delacorte saying she was interested in my manuscript (but that she would be out of the office for vacation and wanted me to call her back after one torturous week), I called up Lauren for advice. I was agent-less at the time, and Lauren was the only industry expert I knew who felt approachable. She squealed and congratulated me and cheerfully told me that if the editor made me an offer, to bump it up a few thousand dollars, since that’s what they expect. After the discovery that I was terrible at negotiating book contracts, I called Lauren. I told her the good news and, a bit embarrassed, said that I suspected it would be a good idea for me to get an agent. ASAP. And being the generous soul that she is, Lauren gushed excitement, then gave me her agent’s phone number. He ended up referring me to my unbelievably wonderful agent, Erin Murphy (who is also Lynda’s agent!) Erin proved to be worlds better at contract negotiations than I could ever dream of being. Thanks for reading! May you all find the perfect mentor at the perfect stage of your writing journey! Next Why Did the Monkey Cross the Road? As always, an inspiring post. I can't wait to read Laura's book, THE QUEEN OF WATER. It sounds incredible!Thanks for sharing, Lynda. Thanks, Laurie– I hope you like the book! And Lynda, I was really moved by your lovely intro– thank you! I so look forward to your Mentor Mondays, Lynda. It's inspiring to learn how a person can so greatly influence someone's writing life in so many different ways. Now to go look for Laura's amazing book…. I think it's so amazing your agent creates a retreat for all of you. That's someone with your best in mind.I have an agent mate who is a year and a half in front of me, publication-wise. She has been great for questions and wisdom. Plus we've become critique partners, which is a plus. What a wonderful post! I live in Colorado and have meet both Laura Resau and Lauren Myracle at local events. This pretty much confirms the impression I've long held–they are both kind and exceptional people. :)I look forward to reading more Mentor Mondays! Great interview, Laura and Lynda! I adore Laura's books, and can't wait to add THE QUEEN OF WATER to my bookshelf. I'll save a place next to that one for Lynda's debut novel, too. 🙂 Can't wait to see you both in Austin! Omigosh, what a cool bloggy thing, Lynda. And Laura–you've made me blush! (I *like* blushing in cases like this, though.) I am nowhere near as cool as you make me out to be, and your talent–der–would have gotten you anywhere you needed to go regardless. But man-oh-man, do I feel honored. And The Queen of Water looks FRICKIN' INCREDIBLE!!!!! !